" #JubileeRestInPeace" Youths chant in a Presidential rally in Rabai, Kilifi. - Bana Kenya News, Real African Network Tubanane. Home Mombasa " #JubileeRestInPeace" Youths chant in a Presidential rally in Rabai, Kilifi.
" 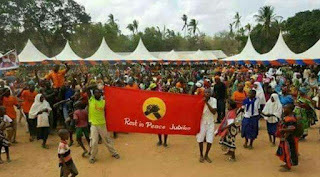 #JubileeRestInPeace" Youths chant in a Presidential rally in Rabai, Kilifi. President Uhuru Kenyatta with his deputy William Ruto at the coast has given a massive mileage of Jubilee in the Coast region. The president visited mainly in Lamu and Kilifi counties in his four-day tour at the coast. Today at Rabai, a group of Jubilee supporters clashed with ODM supporters at a president rally at Mkapuni. The Youth who chanted "Jubilee Rest In Peace" has also banners which written the same slogan. The youth had ODM T-shirts and disrupted the rally at Mkapuni where the president and his deputy were expected to sermon their members. The youth were then dispatched by riot police at the venue, The president is also expected to attend a massive rally at Tononoka ground where he will propose the Jubilee candidate for Mombasa gubernatorial aspirant. A Mombasa businessman Suleiman Shahbaal is expected to be coronated as the Jubilee Mombasa kingpin. The President is also expected to open several projects in Mombasa tomorrow. The president urged the coastal people to vote for him because the projects that he has a plan to start at the coast are massive. The people who accompanied the president include the Kwale governor Salim Mvurya, Malindi North M.P Gideon Mung'aro, Mining cabinet secretary Dan Kazungu, Kilifi women representative aspirant Priscilla Munga and Kilifi senatorial aspirant Kennedy Nyale.